Having lived a fair chunk of my adult life in black-plurality or black-majority areas, those green circles' locations, in general, do not surprise me. It's a bit sad. And, it has political ramifications. If the GOP did not have 50 years of perception, and reality, with the "Southern shift," of having a large anti-black element, it would be getting more black voters precisely because of things like this. Click here for an explanation of the data source for the graph (it's the 2007 version of Pew's religious study; a new one came out earlier this month, but the raw data from it isn't yet available), the calibration of the graph and more. In Southwestern states (counting Texas as Southwestern for this purpose), one should note the rise of various Hispanic evangelicals, especially Spanish-language Baptists, whether affiliated with the SBC or not. They're not specifically marked on this chart, but, for the sake of argument, I'll place them where the SBC is, roughly. Update, Jan. 17, 2018: Expect more and more of them to come, AND to look at allying with the GOP, as evangelical religion continues to grow in Latin America AND to more openly ally with center-right parties there. Speaking of Baptists, one sidebar. 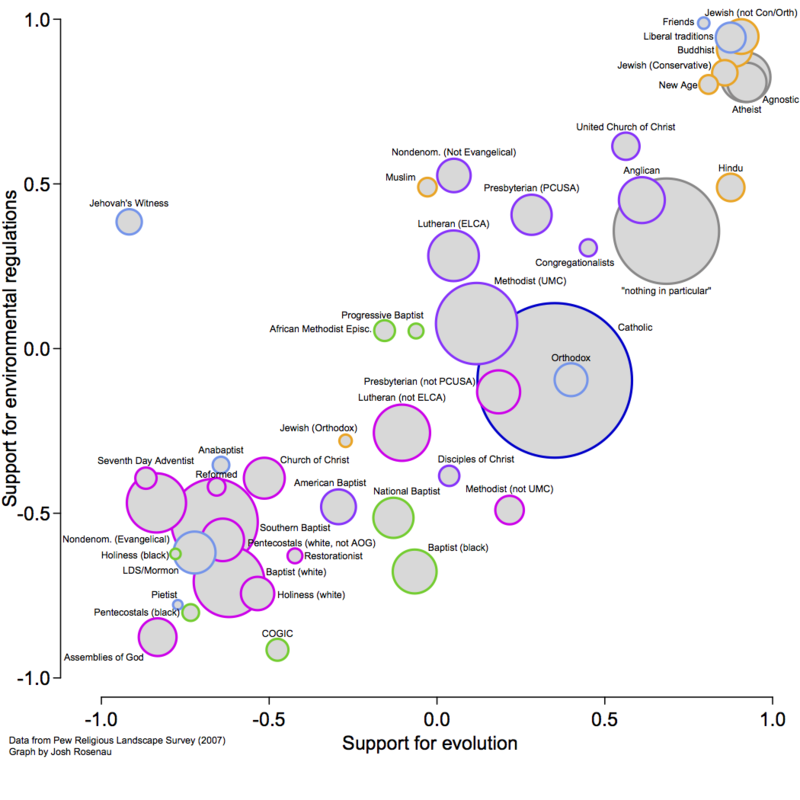 It's interesting that American Baptists, while more liberal-minded on evolution than their Southern Baptist kin, don't track any higher than them on environmental activism. I wonder if that holds true for other federal regulatory activism. In Grant’s version, evangelicals cluster together as advocates for small government in general who nevertheless want government to take a bigger role in promoting morality, while historically black church members cluster together as advocates for greater government action and greater role of government in morality. For people who think demographics will thus magically guarantee Democratic party success in the future, this is why I have said before and say again: Think again. That includes people who think "most Hispanics are Catholic." Actually, only 55 percent are. Of the Protestant Hispanics, more than 70 percent are evangelical. And, among those Catholic Hispanics, if their immigrants, they likely are more conservative on social issues than US Catholics, anyway. Definitely, a large chunk of those evangelical Protestant Catholics are Latino immigrants. And, more and more of Hispanics are from those Protestant-explosion areas of Latin America south of Mexico. I've written about this plenty of times before, most notably here, with detailed graphics, most notably the one at right. Key takeaway from that "here" link? Hispanic Protestants, in Bush-Kerry, broke almost as much for Bush as did white evangelicals, as that graphic shows, at right, with original story here. Pew offers more information of relevance. The biggie is that a little less than half of Latinos are Catholic and a full one-fifth are evangelical Protestant. I've also covered somewhat related issues, namely, the idea that minorities may look more to Washington and less to Austin for help in general. But that graphic above is the biggie, and is reinforced by the one at right. A growing number of Hispanics are evangelical Protestants, and are likely to vote Republican. Catholic Hispanics may have different concerns than other Democrats. And religious "nones" may be tuned out to politics as well as religion. (Dos Centavos claims Latinos nationally are moving further left on the two hot button social issues. Without links in the piece, I remain a bit skeptical. Sorry. Anyway, back to all these differences. Again, if you're Texas or national Democrat type, please, think again. Don't assume Hispanics are Catholic, and don't make other assumptions related to that. I mean, if you've lived in this state for any amount of time, especially if you've gotten off the main drags in big cities, you can see plenty of churches with names like "Primera Iglesia Bautista." Folks, those churches aren't inhabited by Anglos, and in case you can't figure out that last word readily enough, they ain't Catholic. And also don't assume that Hispanics, whether Catholic or non-Catholic, are going to agree with all white liberal Democrats on social issues; don't assume that Hispanic Catholics dine at the same cafeteria as white liberal cafeteria Catholics. And, if they're immigrants, unlike African-Americans, they have no expectations of socially activist governments in general. Now, it's true that many of the Hispanics from further south than Mexico are illegal immigrants and can't vote. But many already have kids born here the USofA who will soon be old enough to do so, if not already. And, many of them, like their parents, are still involved with the local Primera Iglesia Bautista. Carrying assumptions about Hispanics, especially recent arrivals, is part of how Democrats are continuing to lose elections in Texas. Let's also not forget Maslow's hierarchy of values. For immigrant Hispanics living in colonia-type conditions, clean running water, an indoor flush toilet, and a secure job that pays at least a few cents above crap, long before they worry about gay rights or even reproductive choice. I don't recall Wendy Davis, or previous Democratic gubernatorial candidates, campaigning in the Valley on these issues. Until they do, they probably won't draw much enthusiasm. Finally, on a different demographic, Slate's Jamelle Bouie says Democrats shouldn't lean too hard on the age demographic either. #Fracking and a bridge too far?